What better way is there to close out another year of collecting than with a good old fashioned box break? I happened to have half of a $25 Target gift card left over from Christmas yesterday, so I decided to use it on a $9.99 blaster box of 2011-12 Score, just on the off chance that I pull a Howard base for my PC. Well, that didn't happen, but I did manage to get a few nice ones from the box, more than I expected for sure. First, here's a look at the box itself. 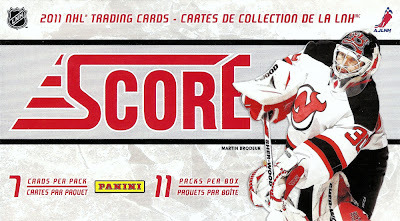 This is something I want to do for this and any future box breaks, to differentiate from pack breaks. Plus the box top is something that most people don't show with their posted breaks, so it's something else to look at. I did end up getting at least two duplicates of base cards that I can remember from just 11 packs, so that's not all that bad I guess. Anyway, here is one of the Hot Rookies I pulled and the rest of the inserts. While it's not "The Nuge," this Cody Hodgson was the only name I recognized out of the six Hot Rookies I pulled. I have to say that the design of this set is about on par with last years the more I look at it, but could still use a bit of work for next year. I really like the idea of the Sudden Death set, but I think the execution was a bit off the mark. I don't know what it is, but there's just something off with this design in my mind. Maybe it would look better as a vertical set. Who knows? 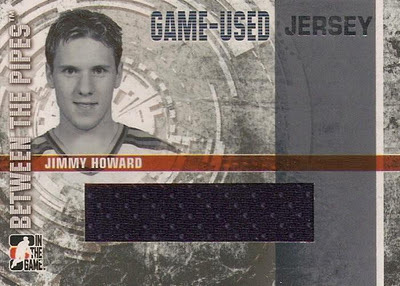 Since there isn't a Howard card in it, I'm not all that concerned with it at the moment. 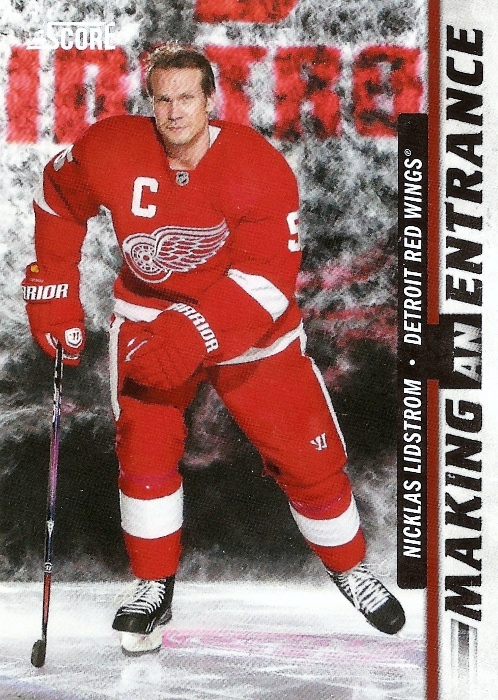 This next insert is also a neat idea and the Lidstrom that I pulled looks great and is a nice addition to my general Red Wings collection. If only this were the Ovechkin. Oh well, what can you do. 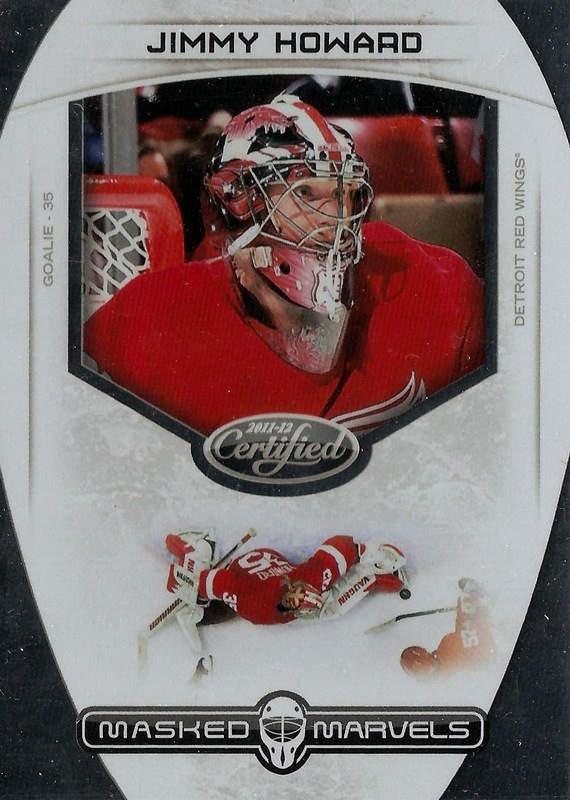 If anyone wants this, I'm willing to trade it for pretty much any Jimmy Howard card I don't already have, including base cards. This should be it for me as far as packs/boxes of Score for this year, as now I'll just focus on tracking down the Howard singles I still need for the PC. It seems like it's been forever since I've done one of my picks, so here goes nothing. 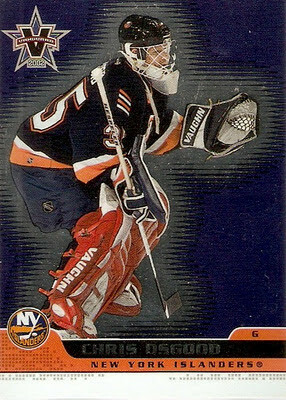 This is another one of those cards that I thought was the coolest thing as a kid in the late 90's. It's a Dmitri Mironov from the 1998-99 Upper Deck SPx Finite set. This one happens to be the Radiance version as evident by the "Radiance" text on the left side. You can't tell from the scan, but that this thing is numbered out of 4750. That's insane compared to some of the print runs in today's world. I should also note that the "base" versions were also numbered, to 9500. 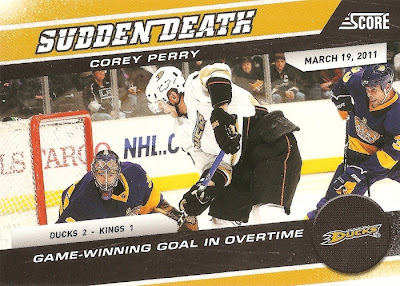 As far as the design of the card, I definitely like the fact that they went with the horizontal setup, as it allows for the massive ice rink shaped gold foil stamp on the left side. The stamp itself is probable the only downside, as it takes up I would say at least 1/8 of the total surface area of the card front. I think there is one more tier of this set, the spectrum version, numbered to just 300 copies of each. That definitely tells you what era these things are from, when the lowest print run of a rainbow is 300, compared to the bazillion 1/1 parallels that are out there today. 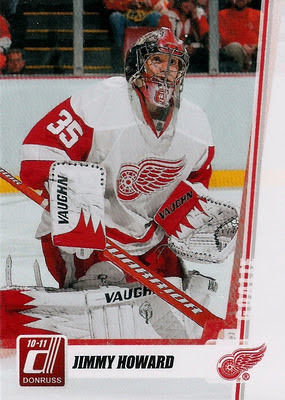 Dmitry only played 11 regular season and 7 playoff games with the Wings after being traded from Anaheim during the 1997-98 season. He would go on to win the Stanley Cup that year and move onto Washington, the team the Wings swept in the finals. Since he only played a handful of games in Motown, I wonder how many cards were actually made featuring him in a Wings jersey, like this one. So there you have it, a bit of a blast from the past that shows where this hobby has gone as far as parallels and serial numbering. What are your thoughts? 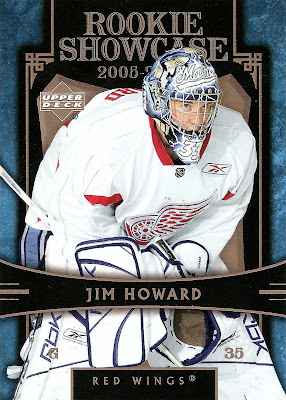 Now that Jimmy is becoming one of the better goaltenders in the league (22-8-1, 1.95 GAA, and 0.927 SV%) there is a lot more competition when it comes to collecting his cards. This is a double-edged sword, because on one hand I want Jimmy to succeed and get better, while on the other I'd like his cards to stay in my price range. Gone are the days of 1-2 years ago when I could sit on an eBay auction until the last minute at $0.99 and either win outright or maybe deal with a few last minute bids. Now, if I'm lucky I can get away with a so-called "steal" like the one I believe I have here at just $5. 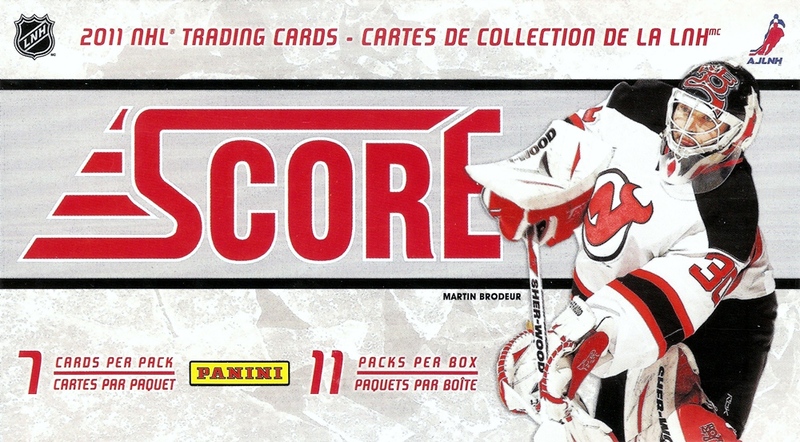 This one is from the 2005-06 UD Rookie Showcase set. 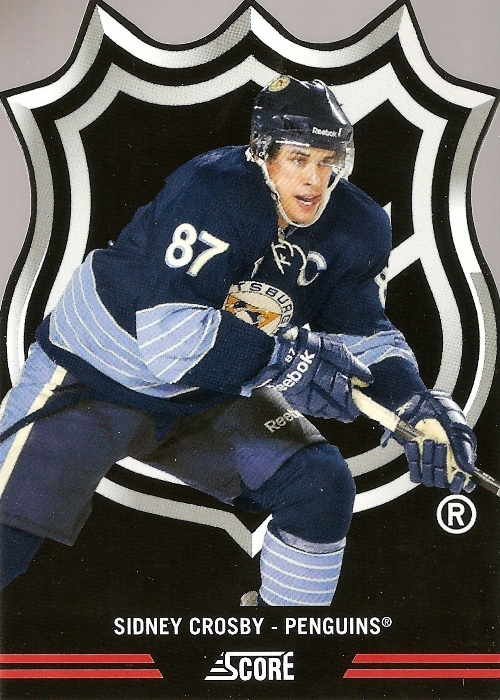 I believe it was released in parallel with the Hockey Showcase (shown here) set that could be obtained through the mail from Upper Deck around the beginning of the 2005-06 season. I've read in several places that there were only 1000 copies of these produced, but they're not serial numbered. I love the look of this set, there is just something about the blue edges and the bronze/black combo that go together well. Not sure if this one is considered to be a true rookie card, as it was not part of a widely available base set. Either way, a card from Jimmy's rookie season is always a welcome addition to the collection. 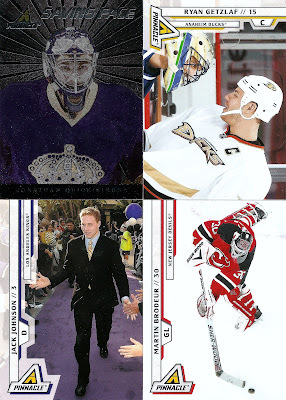 This one brings the collection to 106 cards total including duplicates. Now that I've got a bit of Christmas cash to play with on the bay, I'm hoping to add a few more cards here soon as gifts to myself, but we'll see. When it comes to Christmas gifts for me every year, people usually go with the generic gift card kind of stuff, which is perfectly fine with me, as I'm always in need of new music, movies, etc. 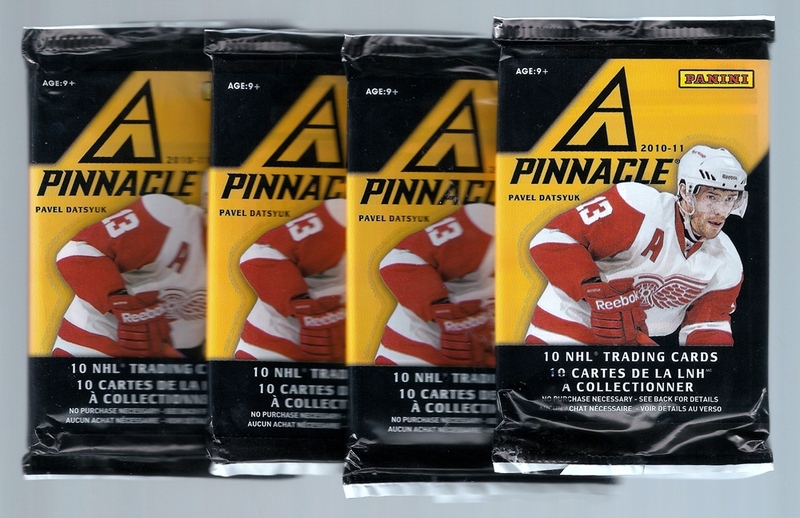 However, there is one gift that I always love receiving, and that is anything to do with hockey cards. These four were wrapped together as a single package and I must say they were definitely a nice, unexpected addition to the collection, especially the Yzerman jersey. 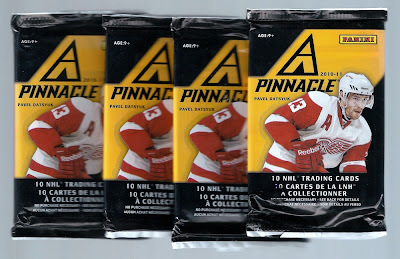 In addition to these I also received four packs of 2010-11 Pinnacle. As you can see, nothing too spectacular. The Saving Face is a nice set, but I still wish they would've brought back some incarnation of "The Mask" like the old Pinnacle sets. Other than that there were just a lot of 'unique' photos like the ones shown here. Now I have a question, did you receive cards as gifts? How do you feel about people buying cards as gifts, as most of us collectors have very specific wants and collecting needs? Hope everyone one had a good holiday weekend. I know I did by spending the last four days in Michigan's Upper Peninsula with family and friends. It was nice to get away from things like work, television, and even blogging and the hobby in general to some extent. Now I'm back and have a few posts lined up that I want to get out of the way before my vacation time is over come January 3rd. The two cards arrived the other day and fit perfectly with this project. 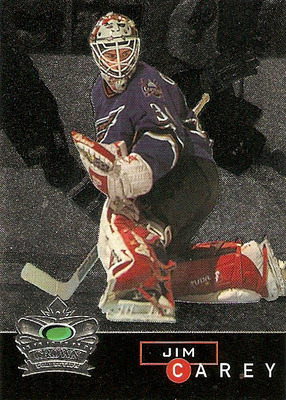 The first is this Bob Essensa from the 1995-96 Edge Ice set. 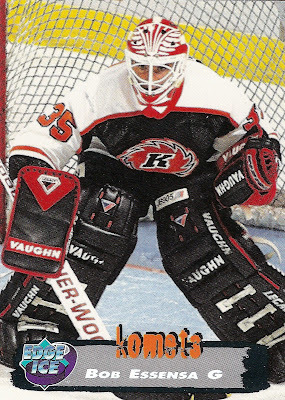 Essensa, a former Red Wing as evident by the mask, is pictured with the Fort Wayne Komets. He played 45 games there in 1995-96 before returning to the NHL with Edmonton the following season. The other one, from the same set, is this Allan Bester. He finished his playing career with the Solar Bears from 1995-98. 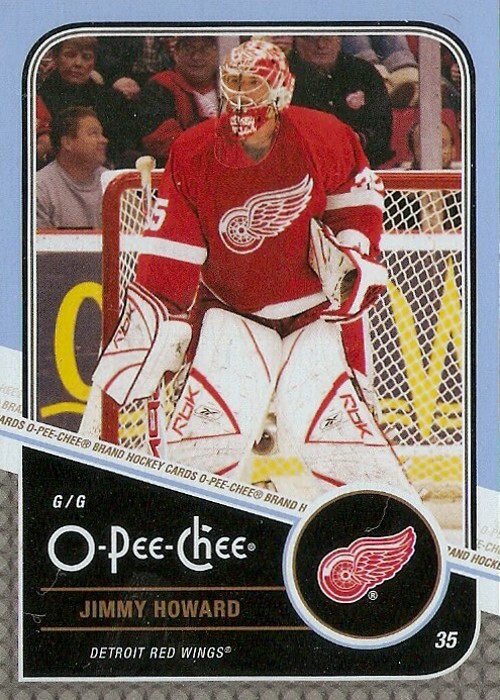 What I don't get is why he still wearing a Red Wings mask at this point. 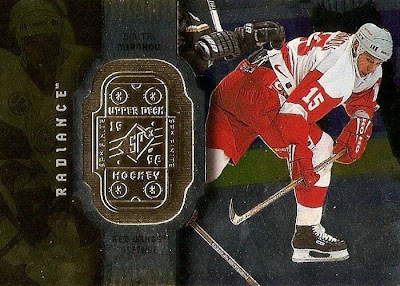 He last played for Detroit in 1991-92 then the Adirondack Red Wings in 1992-93. After that it was a stop in Dallas Stars after two seasons with the San Diego Gulls. Did he have this mask through all those stops? Anyway, these two additions bring the Gallimaufry project to just under 60 cards. Not bad considering I only started this project a little while ago. I'm really hoping to be able to hit the 100 mark with this thing, then we'll see what happens from there. Now that I'm done working for the calendar year and I finally got around to getting a new computer, I have some time to get a few more things posted here. 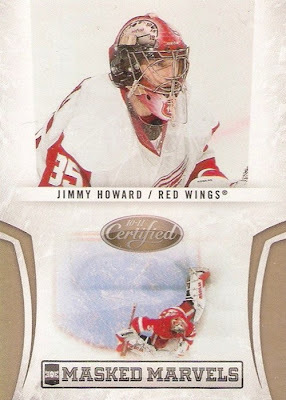 I'll start today with a couple of eBay pickups for my Jimmy Howard collection. They're nothing spectacular, just some base and inserts, but still something to show. The first one was this Masked Marvels insert from 2011-12 Certified. It set me back all of $0.01 plus $2.50 for shipping, which isn't all that bad considering that card would cost me at least around $3-5 at any local card shop or show anyway. Plus this saves me the cost of driving anywhere to get it. Much better than last year's design if you ask me, although I still think they could have done a bit better job of capturing the mask in the upper photo, but I guess its close enough. I also really like the upgrade on the "Masked Marvels" logo at the bottom. The other purchase I made was for a lot of eight cards, some of which were duplicates. I also already had a few cards in the lot, but I needed the others and I couldn't go wrong at $0.99 plus $2.25 for shipping, especially when one of the cards was another RC. The first new one was this base card from 2010-11 Donruss. This is one of those sets that was just ok when it comes to the design. Nothing fancy here, but it's still another one to cross of the want list. Now I just need to find the proof and die-cut auto versions of it. The next two have been on the radar for quite some time now, I just could never find a good enough deal to justify picking them up, plus they're not exactly easy to track down. 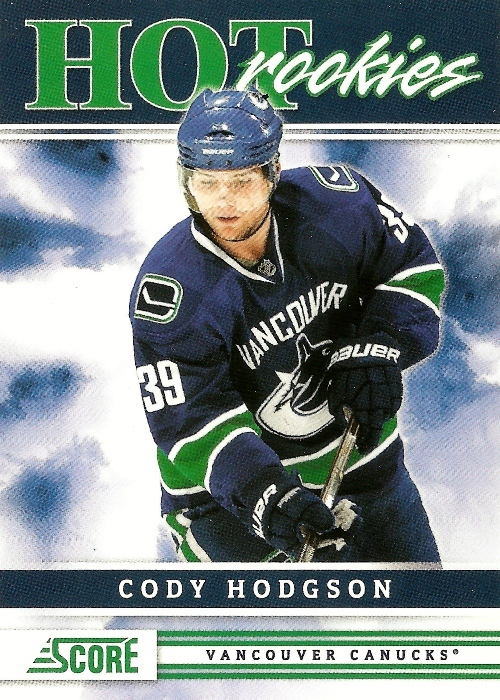 The first is this AHL Top Prospects from 2005-06 produced by Choice Marketing. The other one was the same set, this time from 2006-07. This one has a much better design and the picture looks just that much nicer with Jimmy's Red Wings colored gear instead of his old college gear shown in the other one. The others, which I already have copies of in the collection, were a red border parallel from 2005-06 Beehive and a base card from 2010-11 OPC. I don't mind having doubles like this, because I might eventually send some of these out for some TTM action. The most important part about this pickup is crossing the 100 mark when it comes to total number of cards in the collection, including duplicates. These nine bring that number to 105. I'd have to go back and look to see how many of those are dupes, but I would guess at least ten by now, so I've got around 95 unique pieces in the collection. 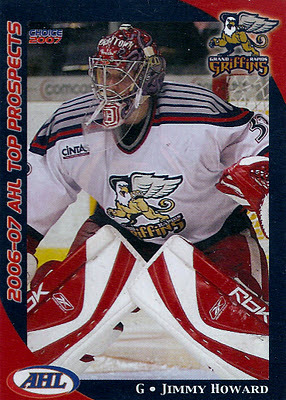 If there's one set I would expect to find stuff for this project in, it would be any of the Between the Pipes sets from ITG, because well, they're all goalies and feature a lot of minor league goalies that seem to change teams quite a bit between all the different levels and leagues, so you never know what you'll find. Before anything else, I have to thank Rob over at Rob's TTM Graphs for poiting this one out to me in the first place. I looked at a pic of it, then realized I busted a box of the same stuff and sure enough, it was in my "recent box/pack breaks" row of my primary monster box. That led to one more too, but that was all. Kind of surprised I didn't come across any others, but hey two is better than none, right? This one's got a lot going on. The first thing I notice is the set of yellow pads Neuvirth's sporting. They don't go at all with the Spitfires look. 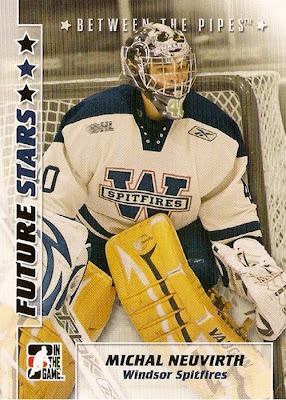 I'm not really sure where they come from, because before playing with Windsor, Neuvirth was with the Plymouth Whalers, as evident by the Whalers mask he's wearing. So that's three teams in there: Windsor, Plymouth and some mystery yellow/white/black team. Here's the other one I thought I would share. This time it's Ondrej Pavelec of the Chicago Wolves. 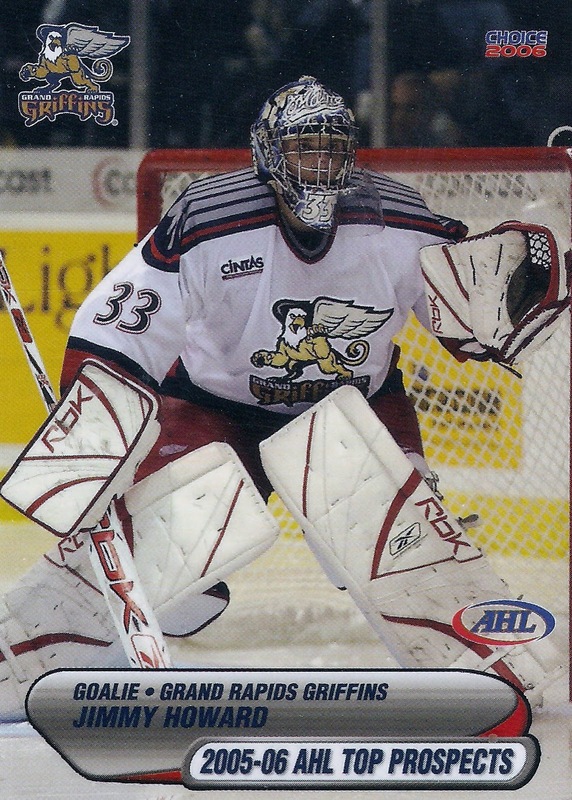 It's a bit less obvious here, as I almost missed it myself, but if you look at the side of Pavelec's mask you see the Cape Breton Screaming Eagles logo. It also looks like he's wearing pads that go with the mask, but they could be for Chicago, hard to tell. So there you have it, two more new additions to the project that were found by someone other than me. That's what I love about this hobby, people are always looking out for and willing to help others, well for the most part at least. Thanks again for the heads up Rob! It's taken almost two weeks now, but I can finally be done with the posts featuring pickups from my recent Gibraltar card show trip. 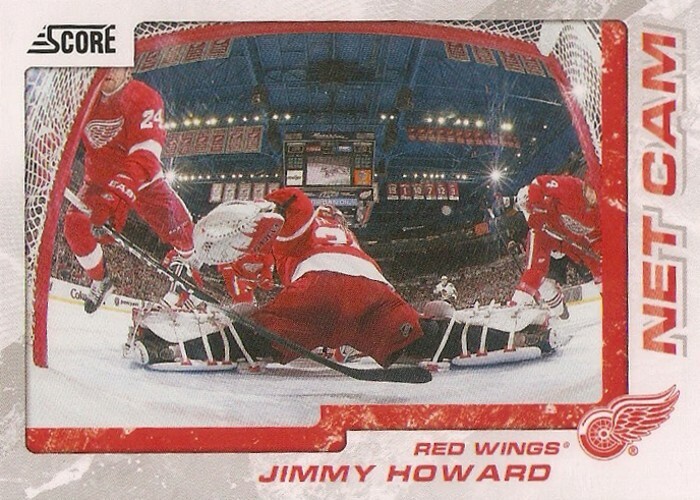 The first of the lot was this base card from 2011-12 Upper Deck Series 1, featuring a nice low-angle shot that you don't see all the time. I just wish it didn't have the same picture as this year's Score design, oh well what can you do? 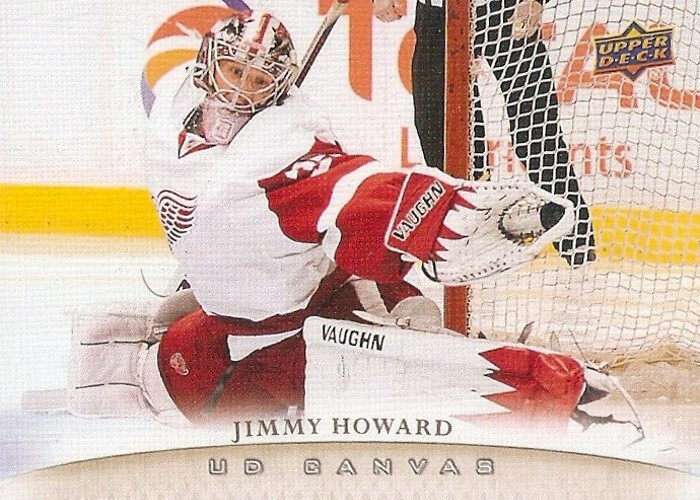 Next was another card from 2011-12 UD Series 1, the canvas version of the base card, which features and even better action shot of Jimmy, as you can see he just barely made a reaching glove save on the shot. I will say I like the idea of this parallel set, as it gives me something to chase that's not serial numbered in addition to the numbered Exclusives parallels. This one just perplexes me. It's a base card from 2011-12 OPC, but has a picture of Jimmy from the 2005-06 season on the front. I don't understand why UD couldn't have gone with a newer picture, but it is what it is I guess. Other than that the design isn't the greatest, but it could have been worse. They just really need to reduce the size of the OPC logo on these things, don't they? This is just the rainbow parallel of the same card. It's printed on shiny card stock and has a rainbow tint to it. The only major difference is the color of the text on the front beneath the OPC logo. Now I just need to track down the black border and blank back parallels. 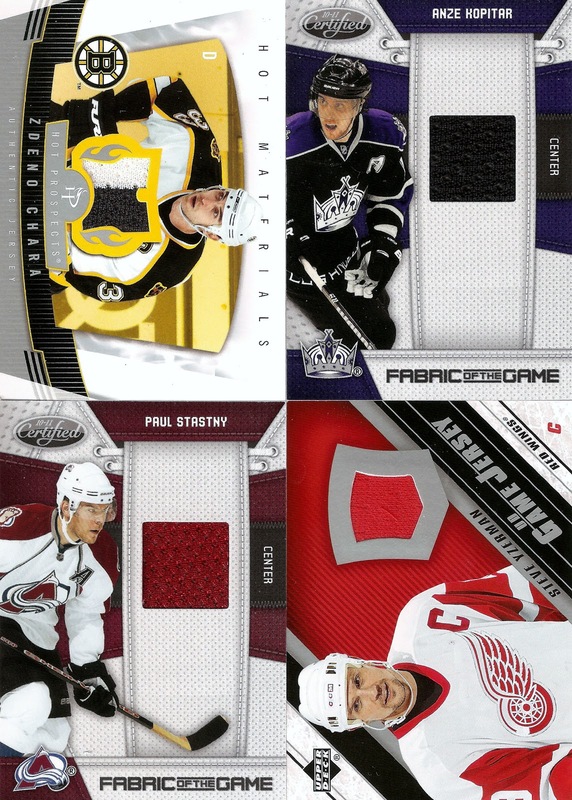 Here we have another Net Cam insert, this time from 2011-12 Score. 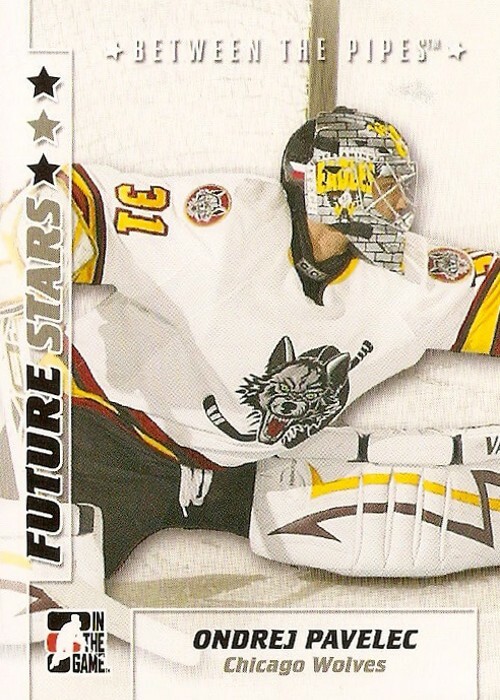 At least this one has a different pic than last year, unlike the Rinne I pointed out a few weeks back. As overdone as this idea is, I still like these cards for some reason. Now were getting to the better stuff. This was the only memorabilia card I picked up at the show. It's a single color jersey card from 2006-07 Between The Pipes. 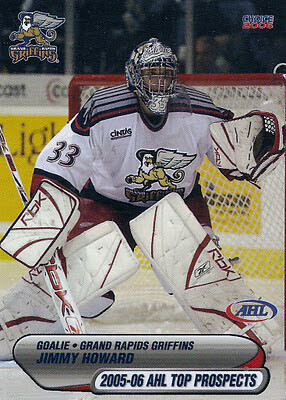 The swatch is actually from one of Howard's Grand Rapids Griffins jerseys, which explains the blue color. Here's the card I got as part of the trade I mentioned earlier. I took some of my Wings traders with me hoping I could use them for something this is what I came home with. It's the premier date parallel, as evident by the Dec 14, 2010 at the bottom, and is numbered 095/100. It's hard to see in the scan, but this is in fact another sticker auto. That's it for now. These latest pickups bring my Howard collection to 96, including duplicates, so it's more like 90 unique pieces overall. Now I definitely have 100 in my sights and hope to get there sometime before Christmas rolls around. Anyway, instead of putting all of these last seven in with the last post, I figured I'd spread it out a little bit, but these are the rest of the quarter and dime box pickups from the Gibraltar show for this project. I don't usually like to be this repetitive posting-wise, but I wanted to get these out of the way before showing off my Howard pickups from the same show. 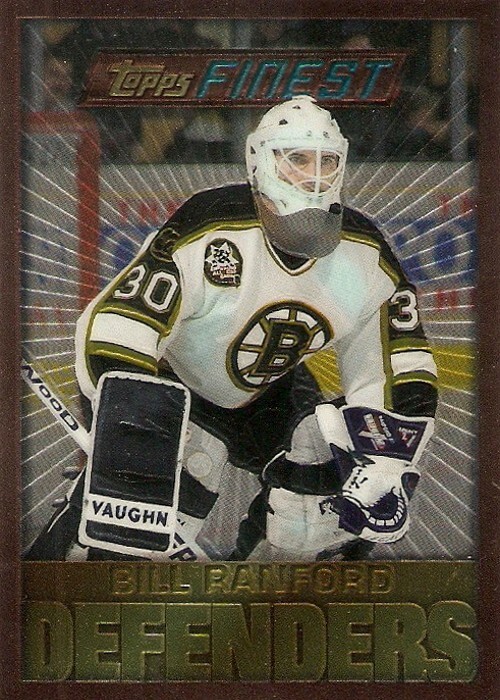 This first is this "Moose" from 2001-02 Topps Chrome. 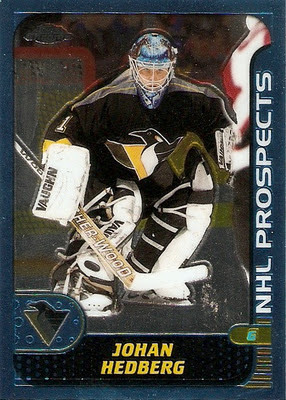 These cards tend to not scan very well, but in this case it wasn't an issue becuase you can clearly see the contrast between his black/white/yellow Penguins gear and his blue moose mask. 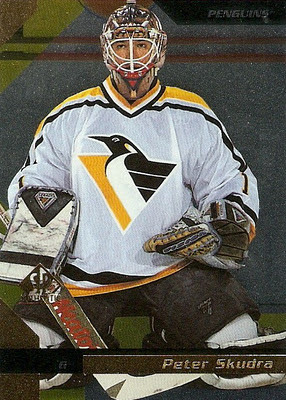 Next we have another former Penguin, Peter Skudra. This one is from 1997-98 SP Authentic. At first glance, there doesn't seem to be that much of a mismatch because the glove, blocker, and pads are plain black and white. If you look closely, you can see Skudra is still wearing the mask from his timw with the Hamilton Bulldogs. 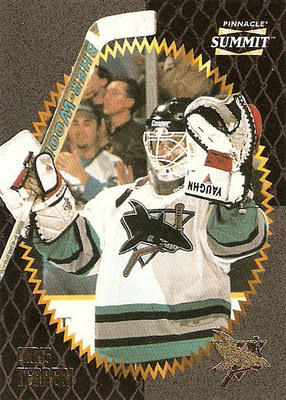 This next one is another one from the 1996-97 Pinnacle Summit set, featuring Chris Terreri of the Sharks after being traded from the Devils. 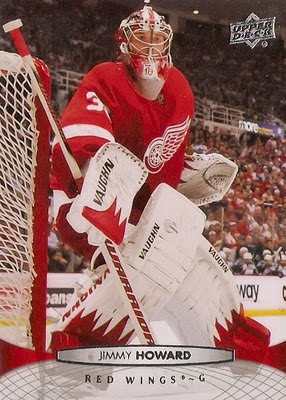 This is clearly evident by the red seen on both his glove and blocker in this picture. 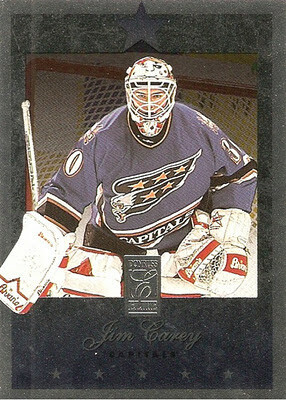 This one is from 1996-97 Donruss Elite, which is an awesome looking set if you ask me, featuring Jim Carey of the Washington Capitals. This one is here not because of a team change, but because of a jersey change. The Caps went to their new uniforms for the 1996-97 season, but Carey's old red and white gear came along for a little white. Yet another one from the Pinnacle Summit set, seems to be a common them with this one when it comes to goalie pictures. 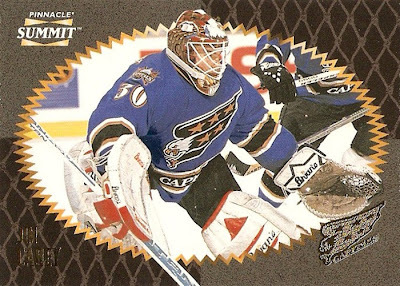 What I find odd about this one is the fact that Carey is wearing a different mask than in the other one, but neither mask really goes with the revamped Capitals jerseys. This last one is the perfect example of a set I had never seen or heard of before stumbling across it while searching the dime and quarter boxes. It's from the 1996-96 Parkhurst International set and shows the same mismatch as the first Carey, but stands out a bit more with the Black Diamond-ish background effect going on. That's it for the Gibraltar show pickups as far as this project goes. Since then I've actually come across two more I want to share, but I'll save those for a little bit later on. Next up will be the Howard stuff I got from the show, so stay tuned for that. We'll start things off with Chris Osgood, who was one of the inspirations for this project with the setup you see here. 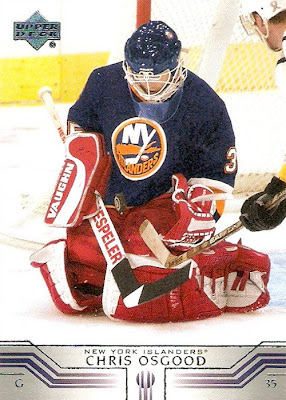 He's obviously playing for the Islanders, but still sporting his Red Wings glove, blocker, pads, and even pants. That's the one I don't get. Don't they make shells that just cover the pants for when guys change teams like this? 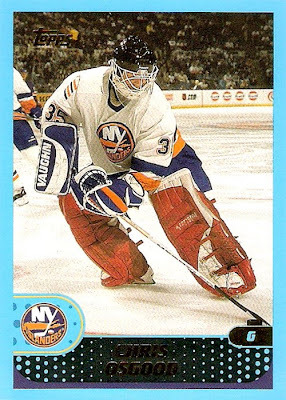 This next one, from 2001-02 Vanguard, shows Osgood a bit more into his Islanders transformation. 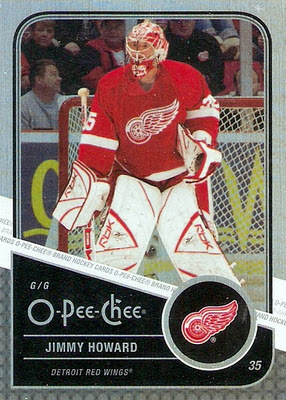 He's got blue and white glove and blocker as well as blue pants, but he's still sporting his red and white Vaughn's from his time in Detroit. Got one more for Mr. Osgood, showing the same setup as the last card, except for the home white jersey of course. This one comes from 2001-02 Topps, a set that always makes me wonder, "what were they thinking" with the blue borders. Now onto Damian Rhodes of the Senators. As you can pretty obviously see in this one, he's pictured still wearing his pads and glove from his time in Toronto. 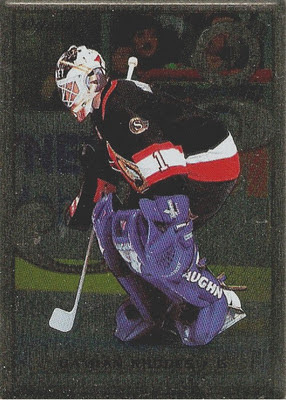 This one comes from the 1996-97 Leaf Steel set, which is an awesome idea if you ask me. I mean come on, how cool is a card printed on stainless steel? Here's another one of Mr. Rhodes from 1996-97 Donruss. It features the same setup as the last one, but is a little bit harder to notice at a glance because the pic is a bit darker. The only thing I don't get about this card, is why the decided to place the picture so far off center. Here's one that looks familiar. That's because it's the shiny parallel version of the 1996-97 Pinnacle Summit card I already have in the collection. This one is cool because it almost looks as though he's got a half and half thing going on, as his right pad is hidden from view. 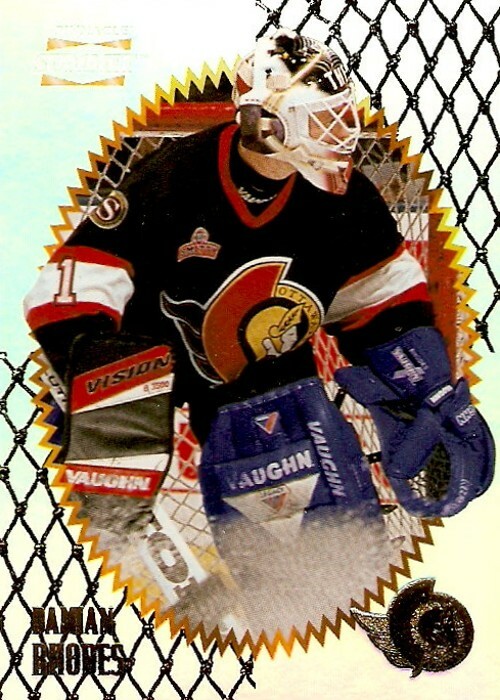 Got one more here, this time from 1996-97 Upper Deck. 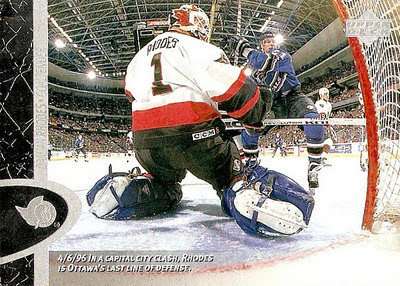 He's still wearing the blue pads in this one, but what I find odd is that Rhodes had the time to use two different masks before getting rid of the blue gear. Must be easier to break them in or something. 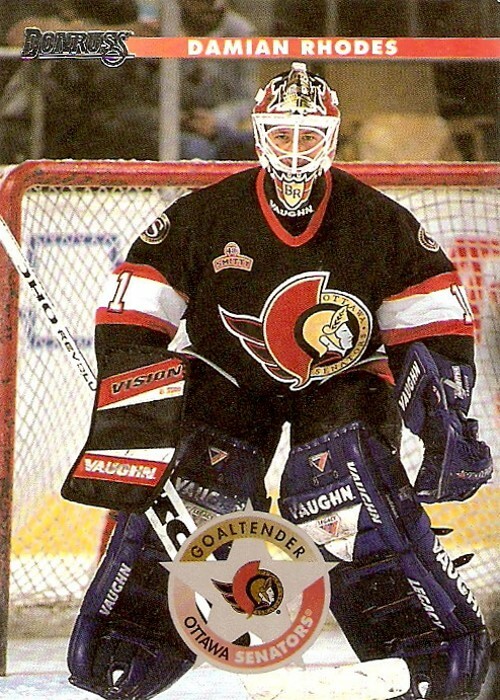 Now for another guy wearing blue and white pads with a team whose colors are red, white, and black. 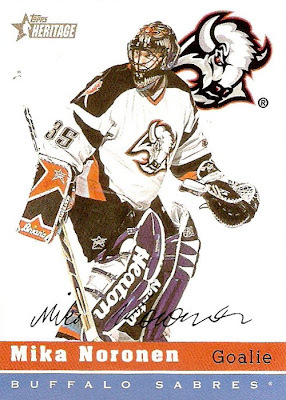 It's another Mika Noronen for the collection, this time from 2000-01 Topps Heritage. 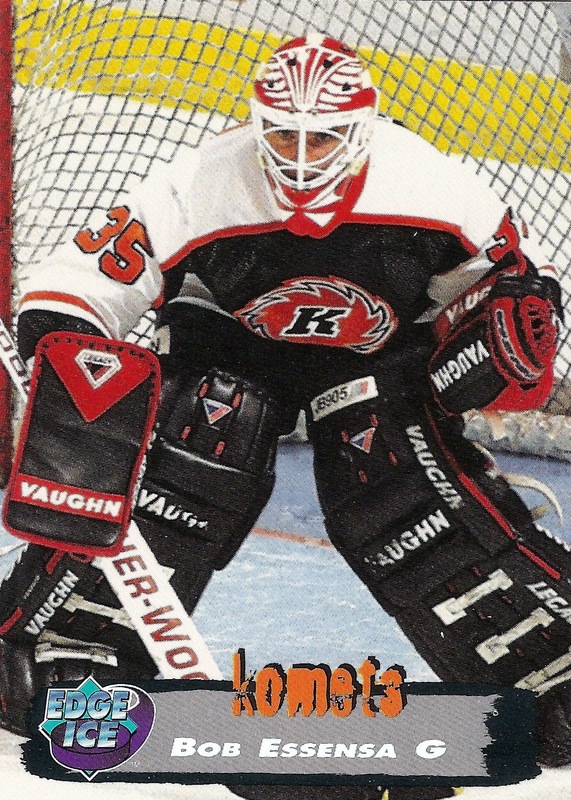 This one is similar to the Premier Plus with the blue and white Heaton leg pads along with red, white, and black glove and blocker. Here's the last one for today, a David Aebischer rookie card from 2000-01 Topps Stars. 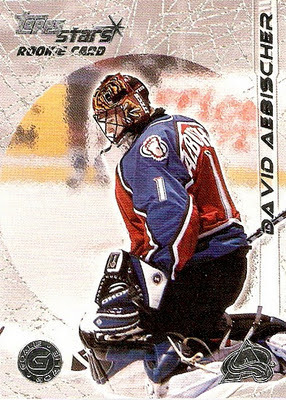 It's got him pictured with the Avs and he has matching pads, glove, and blocker. It's the mask that's the focus here. It's hard to see in this pic, but on the back there's a closeup. 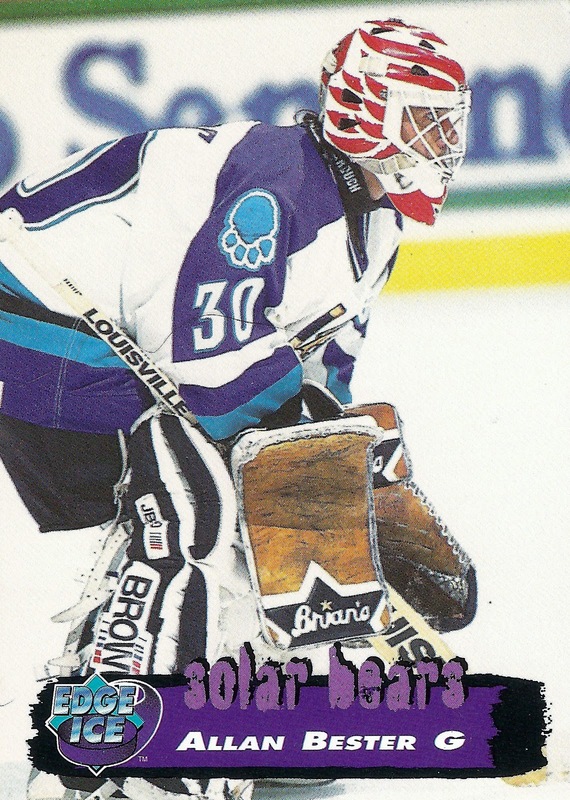 It's from his time with the Hershey Bears of the AHL, where he played prior to Colorado. That's it for now, another nine welcome additions to the collection. I've still got more that came from the same table at the show, so stay tuned for those, if you're interested of course. I'm sure some people think this is a dumb idea, but I don't and I know some of you don't. Regardless, I'm going to keep plugging away at this and see where it takes me.